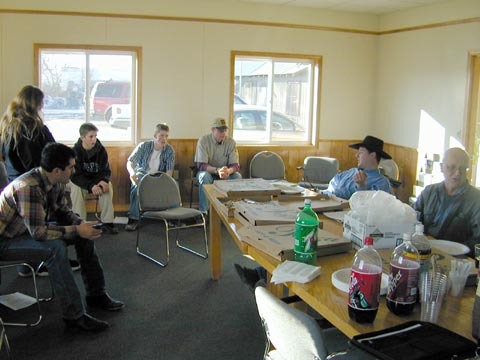 Those attending the meeting were sharing ideas, comments, and criticisms to plan and strategize the next steps needed to propel the Harney County Cattle Grazing Study into its next phase of action. Specific topics for discussion included the website, where students will be posting their research papers and reports, and a prospective coastal/Portland trip for a group of Burns and Crane High school students. Albert Gruen from ORWW led the presentation with an overhead projector displaying the Harney County website pages. Those attending the meeting made a few suggestions for changes. It was decided that only active participants would be mentioned as such on the web page after having completed their participating roles, and that only first names of students would be used for privacy and political reasons. Discussion centered on how the local community might best benefit from the website. One possibility discussed was the coastal/Portland field trip, which would allow local students to interact with the Portland media. Ted commented that his students were very enthusiastic about the list of suggested report topics, and Jimmy had already assigned specific reports/projects to some of his students. Next, we moved on to project implementation strategies. It was decided that the next set of activities should involve posting student projects and reports to the website. A tentative due date was set for March 20th. After some discussion of format, Albert suggested that the students simply put their reports into work documents and/or jpegs. This way they could be quickly and easily posted onto the website, and students could decide later whether to use html (hyperlinks) or pdf (Adobe Acrobat) formats. At Tonys suggestion, a workshop was scheduled for April 12th in which students, working with their teachers, EOARC personnel, and ORWW reps, would begin peer review and website editing processes on the website. Jimmy Zamora thought he would have about 10 participating students from Burns, and Ted Netter thought he would have around 5 or 7 from Crane. 15 students sounded like a good number to everyone. Tony Svejcar offered the use of the Center and its resources, which include Internet access and scanning and printing capabilities (can create 6 foot posters!). Chance seemed excited about going on assignment with a camera. Field trip dates for the coastal/Portland trip were agreed on for April 17th-21st. A tentative itinerary was discussed, which included visits to the Gorge, Portland Stockyards, various Portland media and culture venues, the Coast, the Oregon Historical Society, and the OSU archive department. It was acknowledged that time limitations might affect the proposed itinerary.